Hi, this is Johnn. 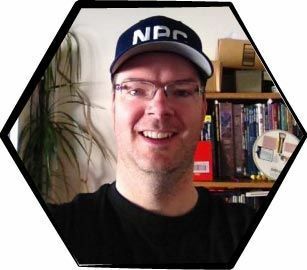 I’ve just setup an online course to show you how to use My Info as a dungeon master tool for brilliant campaign organization. Follow along with a series of videos that shows me using the software. Get an over the shoulder look at exactly how I use MyInfo to stay on top of my campaigns, stay organized, and have any info I need just a couple clicks away. 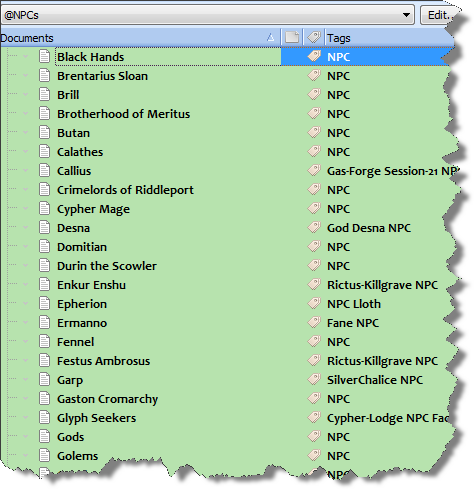 I’ve been using MyInfo as my dungeon master tool for notes and GM organization for years. I’ve tried other methods and other software, but MyInfo helps me run my games best. A new version was recently released, and MyInfo 6 offers even more features to manage your campaign efficiently. Created by Milenix Software, MyInfo offers much more than a place to store your notes. It’s a massive Bag of Holding that allows you to manage every detail of your game dynamically. It lets you make connect notes in such a way that your information becomes a living, breathing Tome of Knowledge for your game this truly is almost magical. MyInfo is not cheap. The Standard Edition is $49.95 and the Pro Edition is $99.95. However, it’s a one-time expense that, for me, has paid for itself many times over. I used GM binders for years. Then I switched to index cards. But going digital meant search! I was tired of flipping through pages of notes over and over. A digital campaign organizer gives me unlimited notes and a way to find and sort them fast. So, in the mid-2000s, I tried a ton of applications out. I tried plain text files, wikis, OneNote, NoteTab, Evernote, WeatherMaster, Hero Lab, MasterPlan, a database and even some free software that offers similar functionality to MyInfo. ENWorld had a massive thread of GM software. So did the WotC forums. I clicked all the links. I installed all that software, too. But, after a ton of experimentation, I returned to MyInfo. It offers features and support I can’t get elsewhere. And it’s made my GMing better and more fun because I’m so organized. But the deal maker for me is always how easy it is to get organized and stay organized with MyInfo. You can spend a whole weekend organizing your binder, cards, OneNote files or whatever system you use. But soon the system breaks down again, right? Stuff gets harder to find as Entropy sinks its claws into your information. That’s why I’ve stuck with MyInfo for so many years. And each new version keeps offering me new features to help me stay on top of my game. I’m going to now list all the features I use that makes MyInfo my killer GM app. You decide for yourself whether this software and its investment is worth it for you. But first, I want to disclose the fact that if you purchase MyInfo using the link below, Roleplaying Tips will earn a small commission from that. I’ve been a customer of Petko’s, the owner of Milenix Software, for years. I’ve submitted a lot of feature requests to him to make MyInfo more useful to me as a GM. I use MyInfo for personal and business use as well, which is another reason this software is so valuable. And Petko has accommodated many of my requests to tweak MyInfo so game masters can get a little extra juice out of it. When Petko emailed and asked if I wanted to be a sales representative of MyInfo, I jumped at the chance. It’s great software. I use it daily. It has my full recommendation because I use the product and get so much value out of it, especially for GMing. Ok, so why is MyInfo a critical hit for GM organization and information management? Take an app like Evernote. All the meta data – the tags and such – are shared by all the “books” you create. Each book represents a completely separate bucket of information. For example, you might have one for work, one for home, and one for each campaign. But all the books share the same meta data! My NPC tag gets mixed up with Weekly Monday Marketing Meeting Notes tag. Work, home and RPG get all mixed up. MyInfo creates a separate “space” for each topic. So my RPG peanut butter never gets mixed with my work chocolate. Further, my Riddleport campaign peanut butter never gets mixed with my Planescape campaign chocolate. Yet, you can still search, link and reference between topics. You get the best of both worlds. For example, I create a topic called “PFRPG Rules” to hold frequent rules my group uses. I also add house rules and house amendments and our interpretations to official rules. When creating an NPC in my Riddleport Topic, I can link to a rule in the PFRPG Rules topic as needed. It’s perfect. Here’s a screenshot of some of my Topics, which are arranged like handy tabs. I can switch topics just by clicking a tab. 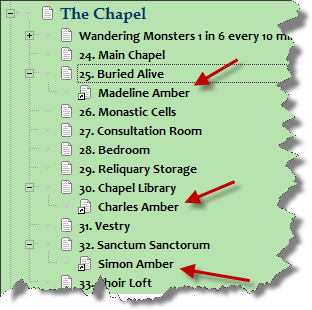 For example, if I’m playing my Castle Amber game, I click that Topic and all my notes are there, ready to use. And if I want to borrow an NPC from Castle Amber to use in my Riddleport campaign, linking back and forth between topics is silly-easy. Each topic offers unlimited Documents. Consider a Document to be like a single Word file or web page. Documents are placed in a tree structure. That makes it very easy to find, hide and group related documents together. If you have not worked with a document tree before, you are missing out! 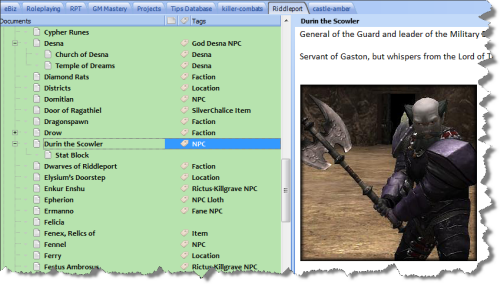 Above, my write-up for the NPC, Durin the Scowler, includes one Document with a picture and fluff, and another Document nested underneath with his stat block. This means Durin’s crunch is not in my face when I want to roleplay him. And when I’m in combat, all his crunch is in one handy document for easy reference. I click the + or – icon beside a Document name to hide or reveal all the sub-Documents. But I still have all the encounters and adventure sections available to me at all times. They’re just hiding behind the clickable + sign! A few other software titles offer this powerful tree-based type of navigation. But MyInfo takes it further by adding Tags and Filters. But first, a quick note to show that you can sort all your Documents in an entire Topic with a single click. 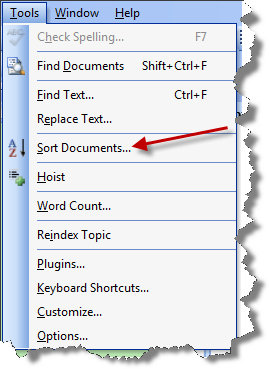 Just choose Sort Documents from the Tools menu. Do that with paper and index cards, hah! A Tag is what you’d expect it to be: a word or short phrase that lets you later see all the Documents tagged as such. This creates very fast look-ups on related information, which is powerful for fast GM reference. See the Tags column on the left? You know what this actually is? A cast of NPCs! That’s right. Instantly I have all my NPCs at my beck and call. It’s brilliant. Same with locations, events, items. All there, available in a cool list, with a click. This is also called filtering. You can create custom filters too, which extends this whole tagging and instant look-up things to a crazy level. But that’s for advanced users and we should move on. Track those and you’re set. And with events just being planned encounters, you can generate an instant list of encounters to run! 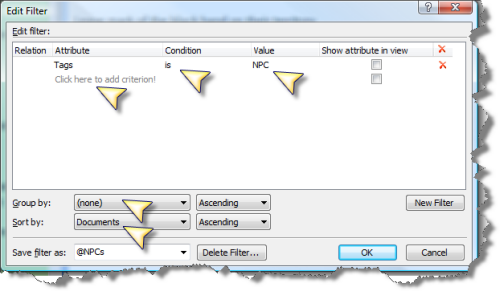 I’ve added arrows to point out some of the ways you can customize your filters. 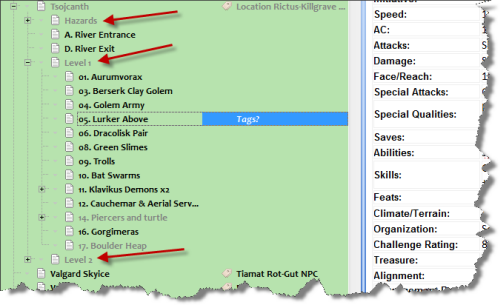 For example, you want to look up all Documents that are NPCs and have been tagged with the Riddleport location? Create a filter with three clicks, save it, and you forevermore have an instant cast list of all that city’s citizens. To sum all this up, you can sort, store, find, and form information exactly how you think as a person and as a GM. Into combat more? Great, use MyInfo as a crunch and rules database. Into adventure planning? Oh man, I have not even talked about the Templates you can create to make that process a whole lot faster. You can create a Template of how you’d like your information structured. I call these Stat Blocks, because they that’s what they are. Another word might be form, like a form you’d fill out. Create Templates for yourself so you can build adventures and encounters fast. Sorry, I have to move on. If you have questions about Templates, just give me a shout. 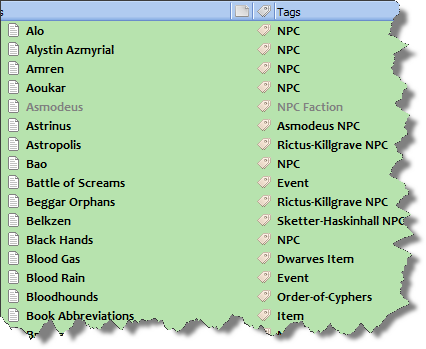 Tags and Filters so you can look things up fast, as per how your brain works and your GMing style. The software conforms to how YOU think. The last thing I want to tell you about is the linking feature. You can link to all sorts of things like Documents, Topics, Tags and Filters. Below, I’m updating the NPC Butan. Turns out he’s in cahoots with Callius. So I want a link in Butan’s info to Callius. That way I’m only a click away while reading Butan to learn who Callius is. Holy cow. I forgot another must-use feature of MyInfo that’s critical to incredible control over your campaign information. You can create a duplicate of any Document and place it in the tree area anywhere you want, including under any other Document. When you modify the cloned Document, you modify all its clones too! What this really means is your information can be in multiple places at once, but it never gets duplicated or out of synch. At a glance, I can see all the Ambers and click on any to view their NPC write-ups. However, I also cloned the NPC Documents and placed the clones in the locations where the PCs will meet each NPC. Now, let’s say I’m GMing encounter #25. Buried Alive. I have Madeline’s stats right there. 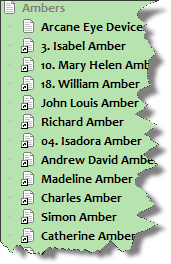 And if I change Madeline’s information, then that change also simultaneously happens to all clones of Madeline Amber. So if I look her up under the Amber Document from before, all the changes I made appear under that entry, too. No more duplicated details that get trumped by some other note somewhere. It’s all real time, in one place, updatable anywhere. Cloning means we GMs can create something once and use it in multiple ways within the context of our task (i.e. our world gazetteer, our campaign plans, our adventure notes, and standalone entries, just as an example). You no longer have to hunt for information, and have your notes scattered all over. There are a lot more features you will use as a GM once you dive into MyInfo. You can export your notes into a full website! (Pro version only.) Just click export, tweak settings how you want, and then export. You get a full-fledged website you can upload or use locally on your computer. When you change or update your campaign information, just re-export to update your website. I use this so I can take advantage of all the Firefox features and plugins during sessions while browsing my campaign as a website saved to my hard drive. Easy and awesome. Search is fast. You can search across Topics as well as deep dive into Documents. Search results appear in a sidebar, so you can keep working. Results are also grouped by locations, for better contextual reference. You can slurp web pages into MyInfo. Use the browser plugin, or just copy and paste. Or just enter the URL and MyInfo will snag it all for you within the program. Bookmarks. Reminders. Calendar. Tasks and Sub-Tasks. Reminders. I use Search & Replace a lot to correct misspellings. For example, when an NPC name mysteriously morphs into something else, I do a quick correction so it’s the same everywhere. You can customize styles, choose fonts and layout configuration, create tables, link like crazy, and all the usual stuff you’d expect. The license lets you install MyInfo on every computer you own. You can also create custom fields. This becomes a new attribute for your Documents. For example, you could create a field called Coordinates. In that goes the map grid cords for all your locations. You can display these in Document tree for fast reference, or just view them on at the Document level. Now you can search, sort and filter by map coordinates!